﻿About a month and a half ago, at the recommendation of an acupuncturist, I cut all dairy products from my diet, cold tofurkey. Prior to making this change, I would often find myself, like many people on a largely vegetarian diet, gravitating to those gloriously stinky lumps of coagulated mammal juice, also known as cheese. All too often, cheese was my default protein. Okay, to be honest, protein had little to do with it. 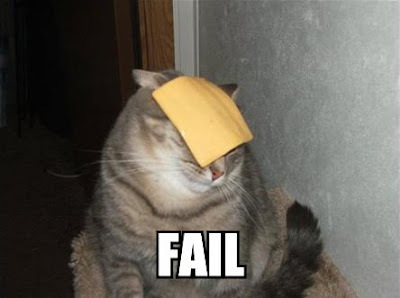 I just liked cheese. Correction:I was obsessed with cheese. So addicted was I to its salty, acidic, gooey, stinky goodness, I would constrict my big, cheesy gut in a Chinese jumprope tourniquet and sweat profusely, shaking with the cheesy DTs, before compulsively ingesting its stank glory . And while cheese was really my weakness, I should also mention that I really loved half-and-half in my coffee, crema in my burritos, and even the occasional (read: frequent) late-night bowl of Ben and Jerry’s. 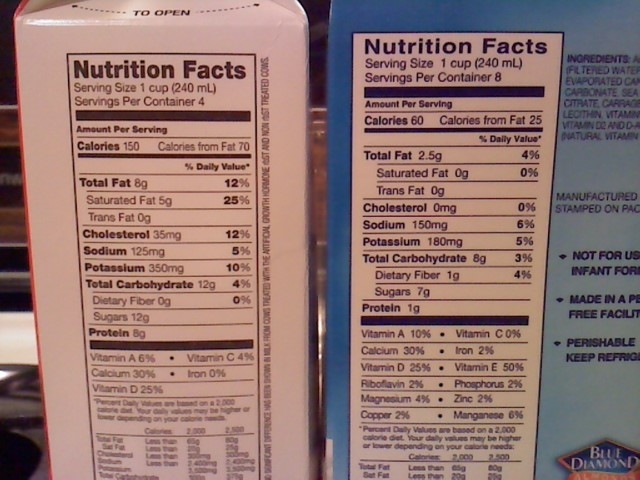 Cow's milk versus Blue Diamond Almond Milk. Image courtesy of A Voice 4 Animals. Strangely enough, the transition has been easier than I would have imagined. At first, I tried some of the cheese substitutes on the market, including the new Daiya products that vegans (of which I am not one) seem to swear by these days. Sadly (or not), I quickly realized that some things are not meant to be replicated (read: I'm not into melted plastic). Instead, I started replacing my cheese cravings with healthy fats and salty flavors, including olive oil, avocadoes (I eat an average of one every day! ), tahini, tamari, pistachios, almonds, hummus, and those delicious seasoned seaweed snacks from Korea. I began using almond milk on my cereal, and discovered that it is far tastier than cow's milk. 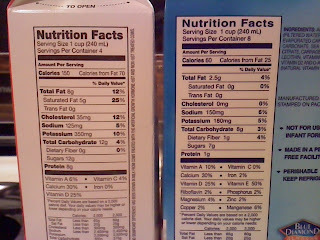 Almond milk is also equal to or richer than cow's milk in most nutrients (including calcium and vitamin D), not to mention lower in sugar, fat, and calories (note the side-by-side label comparison to the right). It also goes well in my coffee, although I’m really loving So Delicious’ line of coconut-based creamers, which are creamy, not coconutty at all, and completely fat-free! I actually think I’m eating more protein now that I’m dairy-free. I’m preoccupied with lentils, peas, garbanzos, crispy tofu drenched in spicy sauces, and this amazingly tasty, all-natural mock abalone (chai-pow yu) that I get in the Chinese grocery. (Yeah, yeah what are you looking at? DON’T MOCK THE MOCK ABALONE!) And vegan-haters, hold your lactic-acid tongues, because still include sustainably raised/caught fish in my diet, and even the occasional organic, free-range egg. Despite the past 20 years or so of red-meat-and-poultry-free living, I find I’m discovering so many new delicious fruits, vegetables, and fungi at the farmers’ markets and Asian grocers, produce I previously overlooked out of what I now see as cheese-induced laziness or plain-old lack of resourcefulness. At the risk of sounding like a cliché, since I’ve given up the cow juice, food just plain-old tastes better. Menu-planning aside, the most positive transformations associated with my life's cheesy discharge have been those I’ve witnessed in my own body. Although I started seeing the Chinese doctor for back and neck issues, I now have begun to see dramatic changes in my physical issues that were unrelated to my initial primary complaints. I have more energy. My hair, skin, and nails are stronger and healthier than they’ve been in years (aside from the expected initial detox breakout during the first couple of days of giving up dairy). My springtime allergies (congestion, sinus pain, and eczema) are virtually nonexistent. Gassiness is a thing of the past. Oh, and I’ve lost eleven pounds. Give me an avocado over a slice of cheese any day! I'll occasionally eat a yogurt or have cream cheese on my bagel, but drinking milk always made me feel gross inside. Glad to hear how well being dairy-free is going for you, maybe it's time for me to just cut it all out? It's possible that it's the cream cheese that's clogging my pores. Yeah, I've never been a milk-drinker myself. I don't understand how people can just sit down and chug that stuff. Ew. Even as a kid I thought it was yucky, unless accompanied by a warm cookie.